Tillerman has asked for more tips when taking videos while sailing, so here are two more. When I was coaching last year at Cabarete, I took videos of my students so they would have something to enjoy after they returned home. I used a Kodak PlaySport and held it in my right hand while holding the main sheet and tiller with my left - something that is easy to do on starboard tack and harder to do on port. In light air this is pretty simple, but it's difficult to see the little screen in the sunlight. So, my first tip when taking hand-held videos is practicing pointing and shooting without looking at the camera. 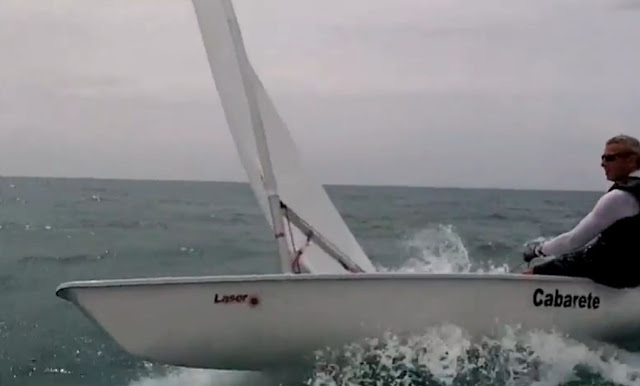 Sailing videos can be pretty boring and it's best to be close to the action. So, at 1:30 in this video you can see my second tip - learn to sail close to another boat, with your wrong hand, facing backwards, going down waves. What could be simpler?